Bayor, Ronald H, The Columbia Documentary History of Race and Ethnicity in America, Columbia University Press, 2004-06-23 [2009-05-14], ISBN 0-231-11994-1 . Blair, Emma Helen (编), The Philippine Islands, 1493-1803, 1911 , (Vol. 1, no. 3). Boot, Max, The Savage Wars of Peace: Small Wars and the Rise of American Power, Basic Books, 2002-04-01 [2009-05-14], ISBN 0-465-00720-1 . Fish, Shirley, When Britain Ruled the Philippines 1762-1764, Bloomington, Ind. : 1st Book Library, 2003, ISBN 1-4107-1069-6 . Kumar, Amitava, Poetics/Politics: Radical Aesthetics for the Classroom, Palgrave, 1999-10-29 [2009-05-14], ISBN 0-312-21866-4 . Painter, Nell Irvin, Standing at Armageddon: The United States, 1877–1919, W. W. Norton & Company, 1989-05-01 [2009-05-14], ISBN 0-393-30588-0 . ^ 文、攝影／林行健. 馬尼拉牆中城 尋百年遺跡. 中央通訊社. 2015-09-16 （中文（台灣）‎）. ^ 異國情調 馬尼拉採擷 - 副刊 - 自由時報電子報. 自由時報. 2006-01-11 （中文（台灣）‎）. 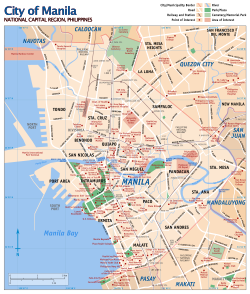 ^ World Weather Information Service — Manila. World Meteorological Organization. [2013-01-13]. 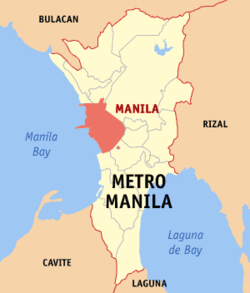 ^ Climatological Information for Manila, Philippines. Hong Kong Observatory. [2013-01-12]. ^ Average Conditions — Manila. BBC. [2012-05-15]. ^ Sister Cities. Beijing Municipal Government. [2009-06-23]. ^ Twin City acitivities. Haifa Municipality. [2008-02-14]. （原始内容存档于2007-10-09）. ^ Mapa Mundi de las ciudades hermanadas Archive.is的存檔，存档日期2012-05-26 (Spanish), Madrid.es. ^ Eight Cities/Six Ports: Yokohama's Sister Cities/Sister Ports. Yokohama Convention & Visitiors Bureau. [2009-07-18]. （原始内容存档于2009-05-05）.